Can Your PPM Software Defuse a Bomb? Sufferin' SaaS-afras Where Can I Test? It was over 20 years ago, around 8 pm. Three Business Analysts and two fellow coders crowded around my desk with the sinking realization that it was going to take an all-nighter to pull off our deliverable. Just then, the senior PM poked her head in with a concerned look and a "What can I do to help?" We shot a round of blank looks at each other, but before we could even formulate a polite reply, she nodded quickly, and said: "Right: I’ll go get some food." Surely, figuring out what the team needs to keep them going efficiently is one of the most important skills a PM can offer. But what happens when your team’s Online Project Management itself isn’t keeping up? The prospect of assessing the performance of sophisticated Web-based PPM Software is pretty daunting, even if you are a technical PM. 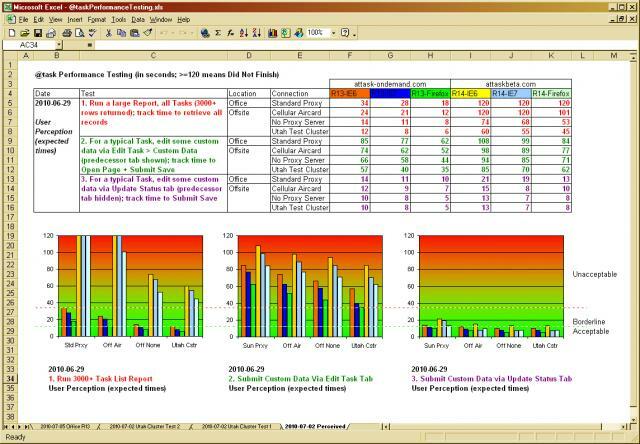 The performance tracking spreadsheet is simple to use and easy to understand. If certain aspects of your Project Management Software are not running as quickly as your team needs them to, you — as PM — can take the initiative to quantify what’s really happening, initiate a solution with your vendor, and keep your team going efficiently. But food’s always appreciated, too.